Blending contemporary architecture with sophisticated accommodations, this premiere hotel provides the perfect vacation getaway for active couples and luxury seekers alike. Enjoy refreshing swims in the unique pools, an extensive, first class spa facility, gourmet restaurants, superior amenities and stylish guestrooms include inspired amenities including Egyptian cotton sheets, flat-screen TVs, aromatherapy and pillow menus, Molton Brown amenities and private balconies with beautiful views. Next, spice up the night at the hotel’s fun-filled selection of bars, including a luxurious seaside lounge equipped with plush beds and stylish chaise lounges. Book by April 15 and Save 50% this Summer at Live Aqua Cancun, an Adults-Only All-Inclusive luxury beachfront resort. This offer is applicable to all room categories with no minimum stay requirements. This offer is valid for new bookings made by 15-Apr-13 for travel between 4-Jul-13 through 17-Aug-13. No night minimum stay required. Applies to all room categories. Not combinable with any other promotion, resort credit or value add unless specified. Subject to availability at time of booking and is not available for group reservations of 20 rooms or more. Existing closed out and blackout dates remain applicable. Posadas reserves the right to terminate or modify this promotion at any time. Other restrictions may apply. If you are looking to relax and rejuvenate while on your vacation, then you must take a journey down the pathway to pampering at a Red Lane® Spa in the Caribbean, where you will discover a sanctuary for mind, body and soul that reinterprets classic European spa rituals with the truly distinct essence of the Caribbean. Utilizing exclusive Red Lane® botanical products and essential oils, we promise that our spa resorts will help you discover a sense of ease and calm found only in our tropical paradise. AMResorts recently announced the introduction of Secrets Resorts and Sunscape Resorts & Spas to the popular destination of Cozumel, Mexico. Sabor Cozumel Exclusive Resort & Spa and Aura Cozumel Grand will be combined to become Secrets Aura Cozumel with updates including the addition of 15 room keys at corner Ocean Front or Ocean View locations for a total 174 redecorated rooms, restaurants modifications to include the brand’s signature Bordeaux, Oceana, and Windows restaurants, and a new shopping area set to open January 2013. The official rebranding will take place by December 2012. Guests of Secrets Aura Cozumel will enjoy the benefits of Secrets Resorts & Spas’ signature Unlimited-Luxury® vacation concept which offers limitless access to gourmet a la carte dining and premium beverage brands, 24-hour room and concierge services, countless daytime activities, live evening entertainment, and more. 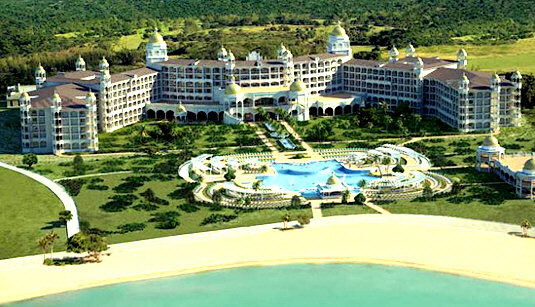 The resort also will feature three main swimming pools. Secrets Aura and Sunscape Sabor Cozumel will share a spa which will debut a signature hydrotherapy circuit and fitness center to be completed by mid-March 2013. RIU Hotels announces the opening of our first Palace hotel in Costa Rica. Located amid the lush natural beauty of Matapalo beach right next to Riu Guanacaste, this luxurious resort will feature modern décor and elegant facilities.This new hotel, fully prepared to provide the best service to its customers, has four swimming pools (one with a swim-up bar), jacuzzi, gym, steam bath and a wellness center “Renova Spa” with different treatments and massages. Everything you need for maximum comfort during your stay. The quality of the cuisine offered at the different restaurants of the hotel is exceptional thanks to our chefs, who prepare a variety of dishes, from classic to the most exotic. You’ll want to try each of our menus and thanks to the All Inclusive service, you will be able to enjoy the buffet restaurant or the four different theme restaurants of the hotel. If your stay is for work purposes, then the Hotel Riu Palace Costa Rica will be ideal for you. It has five conference rooms, modern and fully equipped so you can conduct meetings or events in a professional and simple way, well as various services that you will be able to request. Being on a privileged environment, the hotel offers a variety of activities on the beautiful beaches such as diving or fishing in the Pacific waters, ecotourism in the volcanic areas, and during the day several programs of entertainment for all ages, whether in family or friends. The hotel has a gym, table tennis, volleyball, tennis court, windsurf, snorkeling equipment, kayaks and other water activities. If your favorite sport is golf, Hacienda Pinilla is a course that offers picturesque views and immaculate conditions. Hotel Riu Palace Costa Rica!! Daily stresses of jobs and family responsibilities require a special place to kick-back and indulge in a little self-pampering. To this end, you’ll find a wide variety of resorts featuring onsite spa facilities. You’ll experience a place where the physical, mental and spiritual elements are tended to by a staff of professionals to obtain balance and harmony with hydrotherapy facilities, massage therapies and body and facial treatments. Warm, friendly service and well-appointed treatment rooms are available at many resorts. Plus, classes and programs can be personalized to meet your needs. Consider a weekend spa vacation package with friends – what could be more perfect? 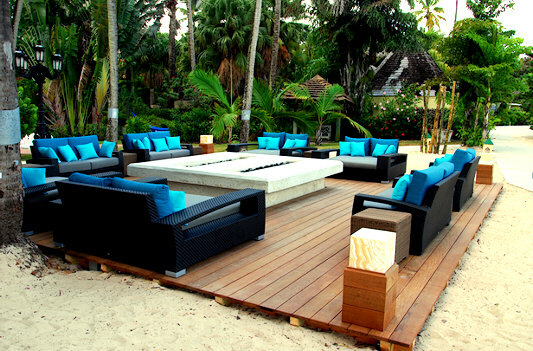 I am happy to share with you all that the fire pits at Sandals Grande Antigua have been completed. Voted “World’s Most Romantic Resort” 14 years in a row, Sandals Grande Antigua Resort & Spa beckons with two extraordinary vacations in one on Antigua’s best and most famous beach, Dickenson Bay. Cooling trade winds soothe the soul as you immerse yourself in a seaside garden oasis graced by majestic palms at the authentic Caribbean Grove. This all-inclusive Antigua resort allows you to savor the sophistication of a fine European Hotel in the Six-Star, all-suite Mediterranean Village. If you would like more inofrmation please call 757-596-2774 or visit the following link! !